P&U Lands | JTR Inc. 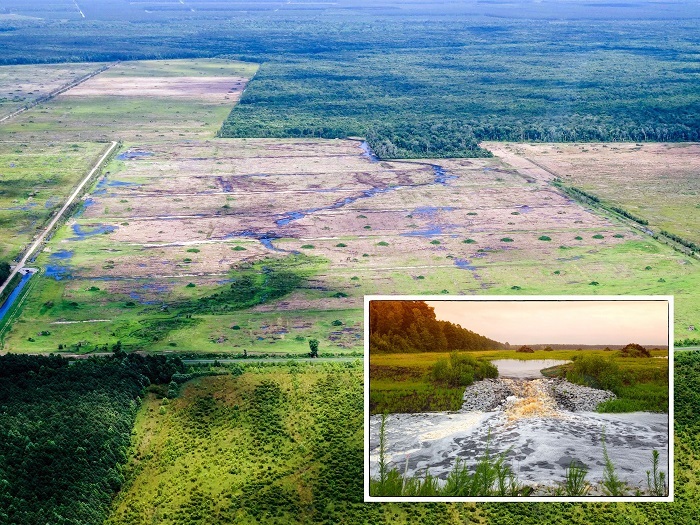 The P&U Lands is a 3,700 acre tract located in Beaufort County, North Carolina, and is part of PotashCorp’s required mitigation under its recently issued state and federal mining permits. This project is part of the mitigation project that totals approximately 8,000 acres. This tract had historically been used for silviculture which presented additional requirements for both permitting and construction with the planned restoration to wetlands and headwater streams. Jonathan T. Ricketts, Inc. was retained to lead the engineering design for both the wetlands and the one mile of headwater streams. Work included onsite soil testing, recommendations for the construction methodology, LiDAR topography of the site, research on nearby headwater systems for use as a reference system, and current and proposed hydroperiod modeling and preparation of a thirty year water budget using DRAINMOD, a program developed at North Carolina State University. Ricketts then prepared restoration plans for the wetlands and the stream design and assisted with the permitting through the Army Corps of Engineers and the North Carolina Department of Environment and Natural Resources. Construction management services were provided by Ricketts and construction is anticipated to be completed in 2015. The site will continue to be monitored for ongoing success for five years. Keys to Success: Communicating critical data throughout the site selection process, LiDAR topography which allowed the identification of over one mile of headwater streams, and monitoring and adjusting construction methodology to accommodate varying field conditions.